When Terry Peoples received a call telling him had won a week with a Tesla electric car, he figured someone was trying to scam him. 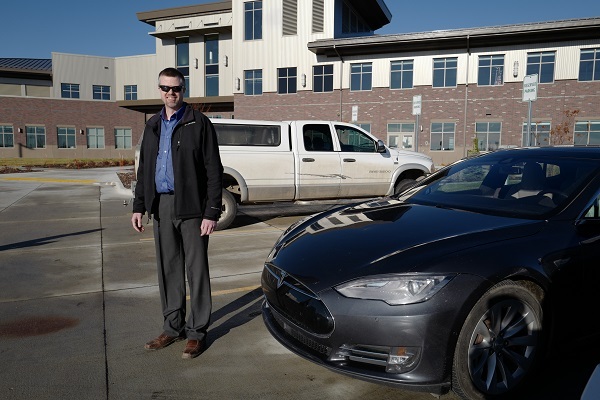 It was real, and this week Peoples has been cruising around Grand Forks and the surrounding area in a 2015 Tesla Model S P85D, all thanks to Otter Tail Power Company’s Electrify Your Ride sweepstakes. He stumbled upon the contest while scrolling through Twitter. “I thought, what the heck, I’ll just throw my name in there,” said Peoples, an Otter Tail Power customer who lives in Gilby, N.D. “Tesla’s done this kind of contest in the past on its website. I’ve signed up for that in the past too, but never got a call,” he laughed. Peoples has long had an interest in EVs and has driven Teslas and Minnkota’s Chevy Bolt. But this was an opportunity to take the technology long-range, as he had to pick up the car in the Twin Cities to start his week of winnings. Even with a 280-mile range, Peoples found charging to be a challenge point. He wasn’t expecting the wait time that came with a low-amp public station, and he learned a lot about the necessity of charging adapters. “It’s a big learning curve,” he said. Minor road bumps aside, Peoples became a fast fan of the performance car’s jaw-dropping acceleration (0-60 mph in about three seconds) and its auto-park and auto-pilot features. 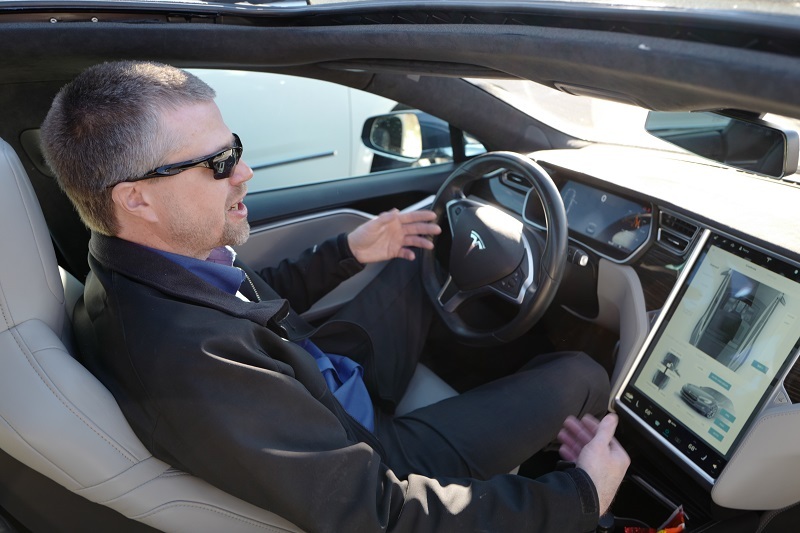 Peoples dove into all of the features and functions of the Tesla and quickly developed a knack for explaining the technology to his colleagues. Peoples didn’t immediately tell people at work that he had won seven days of Tesla time. Instead, the trickster casually parked the car at the EV charging station in the employee lot, plugged in, began his work day, and let the rumors of “Terry’s new Tesla” swirl. The car was certainly a discussion point around the office, with a few colleagues asking for ride-alongs. “They would ask, ‘How far can you get? What happens if you break down? Do you get the same tax incentives buying a used car versus a new car?’” Peoples said. As he plans out his charging points for the drive back through Minnesota to return the Tesla, Terry can’t help but envision one parked in his own driveway. He says that, once battery technology gets better and the DC fast charging infrastructure improves in our region, he would make the move to all-electric.